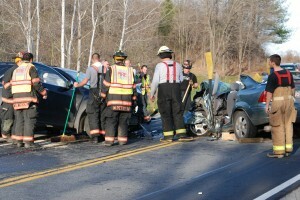 Four people were taken to area hospitals following a head-on collision on Route 22A near Raceville Road in Middle Granville on Monday afternoon. A midsize 2010 Chevrolet SUV headed southbound and a northbound 2004 Ford Focus sedan met in the corner between Raceville and Butler roads at about 1:50 p.m., with the Ford suffering much the worse of the damage. Kaylee M. Rescott, 25, of Granville, who was driving the Ford was taken by Poultney rescue ambulance to Mary J. Tanner School, where a Lifeflight helicopter transferred her to Albany Medical Center. The rest of the injuries were comparatively minor. Her son, Connor Spanos, 15 months old, was taken by ambulance to The Children’s Hospital at Albany Medical Center. Thomas J. and Kimberley Keyes of Vermont, who had been in the SUV, were taken separately by ambulance to a hospital in Vermont. Police said Thomas Keyes complained of a lower leg injury while his passenger complained of chest pain. Rescott has been cited for improper lane change, according to state police. They said a witness saw the Focus drifting into the opposite lane before colliding with the Chevrolet. Police have not determined what caused her to change lanes. Chief Tim Kerber of the Poultney, Vt., Fire Department said his crew used the Jaws of Life to cut the top off of the Focus as well as to get the Chevrolet open. It took about 15 or 20 minutes to get the top off of the car. Kerber said the Poultney department was first on the scene because his crew were covering the Middle Granville station, one of many in service at the two-building fire in downtown Granville on Monday. Residents at the scene said the corner is a bad one for accidents, pointing out the guardrail, which was tilted and bent from a previous incident. The road was closed for about two hours, with traffic eventually rerouted in the interim via Raceville and Butler roads, after the ambulances had cleared the scene. — Derek Liebig contributed to this report.